Have you seen black garlic before? If you see it for the first time you may think it is burned. On the contrary, this seasoning is very valuable in Asian cuisine and is also very tasty. 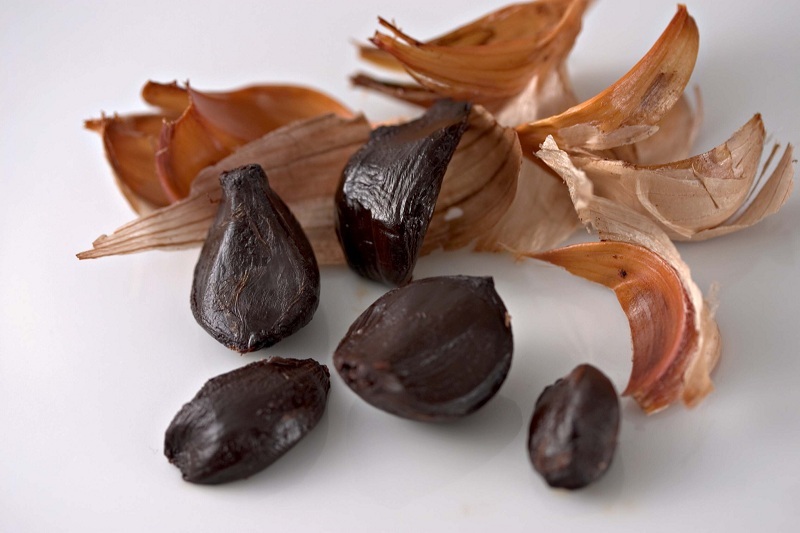 The garlic black has a soft, somewhat sweet with a nice texture and flavor. Although in the West white garlic is usually always consumed, black garlic is a fairly common option in Japan or Korea, where the healing power, antioxidant action, and virtue as an antibiotic of this type of garlic are valued. The process similar to the grape happens. Garlic is oxidized but still tender inside. This process causes the acid taste to go away and become sweet. Thanks to its slow cooking process between 30 and 45 days-black garlic manage to double its antioxidant content and up to its vitamin C level. Far from developing bacteria, black garlic synthesizes more vitamins, more minerals, and more antioxidants. Garlic black has been part of oriental medicine as a way to combat hypertension. Consuming a garlic after each meal-approximately 3 to 5 a day-gives results. Black garlic’s also makes the arteries more elastic, reduces the level of glucose in the blood, and regulates cholesterol levels. Since garlic black improves circulation, it also works as a natural treatment for migraines or headaches. Due to its cooking process and its high level of vitamin C and antioxidant, black garlic’s protects our immune system. In addition, it strengthens it to fight better against viruses, bacteria, and infections. 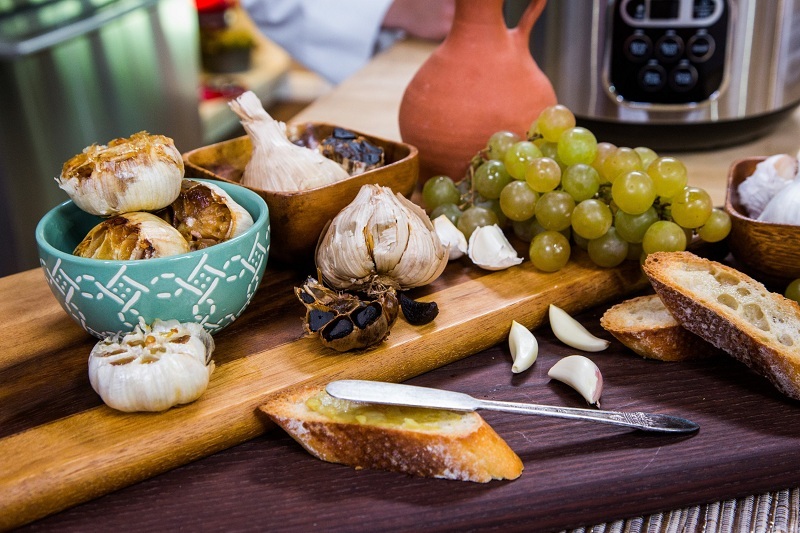 The sweet and balsamic flavor of black garlic is an ideal addition to oriental cuisine. So much so that in Korea and Japan it is common to use it as an ingredient in chocolate. In the United States, it has already become popular to use black garlic’s in several recipes such as roasted chicken with black garlic. In Europe, it has not yet reached such an impact, but it can be found in Asian restaurants and it is becoming more and more common as an ingredient in gourmet recipes and healthy menus. How to consume black garlic? To get black garlic you must go to specialized stores or to the exclusive sections of supermarkets. You can also make your own black garlic, you just have to wrap a garlic head in aluminum foil and bake it in a black, natural note airtight container at a very low temperature. Let your garlic ferment for 40 days in that same container. Keep in mind that this homemade cooking is never the same as the controlled process that is carried out to produce black garlic. So you better try to buy prepared black garlic whenever possible. Combine it with toast with cheese or olive oil. Black garlic is sweet and does not have the sour smell of white garlic. Eat it at breakfast; it will give you more energy. Combine with any dish, so cook it with vegetables and chicken or pork. To control blood pressure or cholesterol, eat it after your meals.